We just arrived in the Dolomites. In just a couple hundred kilometers from Piedmonte everything changes: scenery, food, and language. In particular, the languages spoken where we are staying in Colfosco (loc) are German, Italian and Ladin. When people are speaking Ladin it seems familiar to us, sharing some words and pronunciation with Italian, but we couldn’t hope to reply back. While here we speak either Italian or English. Colfosco is a town in the province of Bolzano in the Trentino-Alto Adige/Südtirol region of Italy. It is more or less in the heart of the area where the Ladin language is spoken. Ladin is spoken in several municipalities throughout Trentino-Alto Adige as well as a few municipalities in the Veneto region. 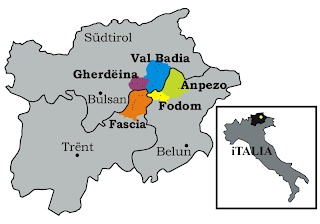 It's somewhat complicated understanding the administrative borders of this area of Italy given that there are communes, municipalities, autonomous regions (like Trentino-Alto Adige), and “non-autonomous” regions (like Veneto) and how these administrative borders overlap with where the Ladin language is spoken. In the graphic, the names of the towns and areas are written in Ladin. Bulsan for Bolzano and Belun for Belluno, for example.